Let’s start with the easiest option for most people: a child seat attached to the stem or rear rack of your bike. These seats are a fantastic and inexpensive way to move a child in the first few years of their lives. The front-mounted seats are usually best for very young children (up to 2 years) since they stay close to your body between your arms, and you can have conversations with them while you ride. From 2-5 years old, kids are usually too big for the front mounted seat, and they’ll need to sit on a rear mounted seat. Having a double kickstand like the Pletscher Twin is a great help to balance the bike while you load and unload! Pros: price: use the bike you already have; easy mounting/unmounting; proximity to your youngest child with a front carrier. Cons: on some bikes it’s difficult to carry cargo and a child together; no protection from the elements; limited to one child in front, and one behind; may limit use of panniers; not every bike easily fits a child seat (although most bikes we sell are designed to carry these seats!). Number of Kids: Two per bike is possible, most people are comfortable with one per bike. There’s a growing chorus on North American cargo bike blogs that an electric-assist box bike is the best way to move your family. We’re not necessarily saying these bloggers are right, but they’re definitely onto something good. Box bikes have enjoyed legendary status in Europe for many decades as practical transportation for cargo and families. These bikes have only recently starting to make an appearance in North American cities. Why are cargo bikes suddenly gaining popularity? There are a few reasons, but none greater than the availability of reliable electric pedal-assist motors (particularly those from Bosch, Shimano and Yamaha). We think the electric-assist option bridges the gap between compact European cities, and sprawling North American spaces, because suburban distances don’t feel nearly as long when you have a little bit of an electric boost behind you. Haven’t tried a pedal-assist bike before? Walk into our store any day and we’ll set you up to try one. The pedal assist senses your movements 1000 times per second, and adds just enough support to make you feel as strong as Wonder Woman or Wolverine. Once you realize your newfound strength, you can imagine doing just about everything on a bike! Box bikes (literal translation of Dutch “bakfiets”) are amazing because they let you parent while you ride, having conversations with the kids up front, while keeping a close eye on them, too. They provide outstanding protection from the elements, and while these bikes are superb at carrying kids, they ALSO excel at carrying cargo. There’s nothing more satisfying than gently tossing a giant pack of paper towel rolls from my shopping cart into the front of my e-Bullitt. These bikes have a super low centre of gravity, which helps with balance, and can be highly adjustable so two people can share the same bike. There’s so much to love about moving your family in a bakfiets. Now I don’t want to say these bikes don’t have drawbacks for some families. They’re expensive (for a bike, but when you think about other transportation options, they start to look downright frugal), they need somewhere safe to be stored (a garage is great, a covered space or “bike pyjama” soft cover can work, too), and there’s a bit of a learning curve to learn how to ride with the linkage steering system. Those drawbacks aside, they’re incredible machines that can get your family moving in new and exciting ways. Pros: easy load and unload; enormous carrying capacity; you can have conversations with your kids (while keeping an eye on them); compatibility with Maxi-Cosi infant seats; four-season ready (rain covers provide some warmth, too); can keep toys, snacks, and other kid things in the box; e-assist makes it easy to cover long distances. Cons: initial cost; size and storage; learning curve to ride a bigger bike. The Babboe City is a great way to get your family started. It’s easy for children to get in and out, and easy for parents to load up with groceries, too! Caught in a storm? Don’t worry, there’s a rain cover for the kids! What if you want a bike that can move your family, carry loads of cargo, and still rides like a bike? A longtail cargo bike can be the solution for you! We love the versatility and all-terrain capabilities of the Benno Boost-E to carry one child (it’s fun as heck to ride), but for two or three children, the category leader is the Xtracycle Edgerunner, which even carry a full-grown adult on the rear “flight deck.” These bikes are tough, four-season ready (although you’ll have to bundle up your kids), and enjoyable to ride whether they’re loaded or not. They’re also highly customizable with options for various styles of front and rear rack, cargo bags that stand up to the elements, and different battery/motor configurations that allow you to go longer distances, or haul more load. The longtails do a very good job of carrying toddlers in a Yepp Seat, and gives older children a bit of freedom to move around and enjoy the ride in the open air, too. But there isn’t any protection from rain or snow, so they’ll need good all-weather gear for those rainy days! Pros: rides “just like a bike”; lighter and more nimble than a box bike (especially comparing bikes without electric assist); can carry three kids and lots of cargo, carry enormous things (I brought a bed frame home from the store last week); carry older children (realistically there’s no limit to age, as long as they fit); can transport the bike in a minivan (or similar) for longer distance travel. Cons: no protection from the elements; can be difficult to balance while loaded if you’re a smaller person; less conversational with kids behind you; cargo loading isn’t as easy as throwing bulky items in a box (but it’s pretty easy with large cargo bags and bungee straps). On the Xtracycle Edgerunner, kids ride on the “Flight Deck” and are secured by the “Hooptie” ring. It really is this much fun! Try our demo Xtracycle for a weekend with your family and see how it stacks up. Don’t underestimate the humble trailer’s capabilities. The trailer has been a staple of North American bike families for many years, mainly because it’s all that was readily available. There are certain benefits to a trailer that you can’t get out of a cargo bike, and we think they still have an important role to play for many bike families. One of the biggest benefits is interchangeability - mom can drop the kids off at daycare, leave the trailer, and dad can do the pickup. Another benefit is for very young children: trailer seats provide head and neck support that other cargo bikes don’t provide as easily, so you can ride with infants less than one year old with a trailer. Finally the conversion of a bike trailer to a stroller (or jogger, or ski-stroller for winter!) is a HUGE benefit. One of the best parts of living in a compact, bikeable city is that you can get off your bike, and walk around neighbourhoods when you arrive. Having one carrier for walking and rolling makes life very easy for parents. Plus, if you get tired, or if rain starts to fall heavily, you can roll onto a city bus to get you home! There’s a reason why trailers have fallen out of favour with some, however. Having kids way in the back can feel less comfortable than having them right in front of you. A trailer lends itself to less interaction with your kids than any other means of family cycling. The trailers by nature also follow the bike low to the ground, so they aren’t as visible to other users on city streets. Finally the weight and cargo capacity of a trailer are limited compared with cargo bike options. Children grow out of a trailer by about 5 years old, and the cargo capacity is limited to about 100 lbs (vs 200 lbs for a cargo bike). If your everyday bike isn’t electric-assist, this is a lot of extra load to carry, and climbing hills or pushing into headwinds can be challenging, too. Pros: Conversion from bike to stroller to jogger; even the youngest infants can be carried; sealed floor to catch snacks and toys that fall down, gives kids their own space; ability to use multimodal transit in London. Cons: Separation of parent and child; lower weight capacity; inconvenient attach/reattach process (I know someone is going to say “it’s EASY”, and it is, the first time. After switching to a cargo bike full time, I rarely use the trailer; cargo bike is EASIER); carrying load can be a drag. The Thule Chariot Cross is a superb “do-it-all” trailer for active families. One of the most fun ways to help your child to gain confidence on a bike, and go a little further than they’d be able to go on their own is a “Trail-a-Bike”. 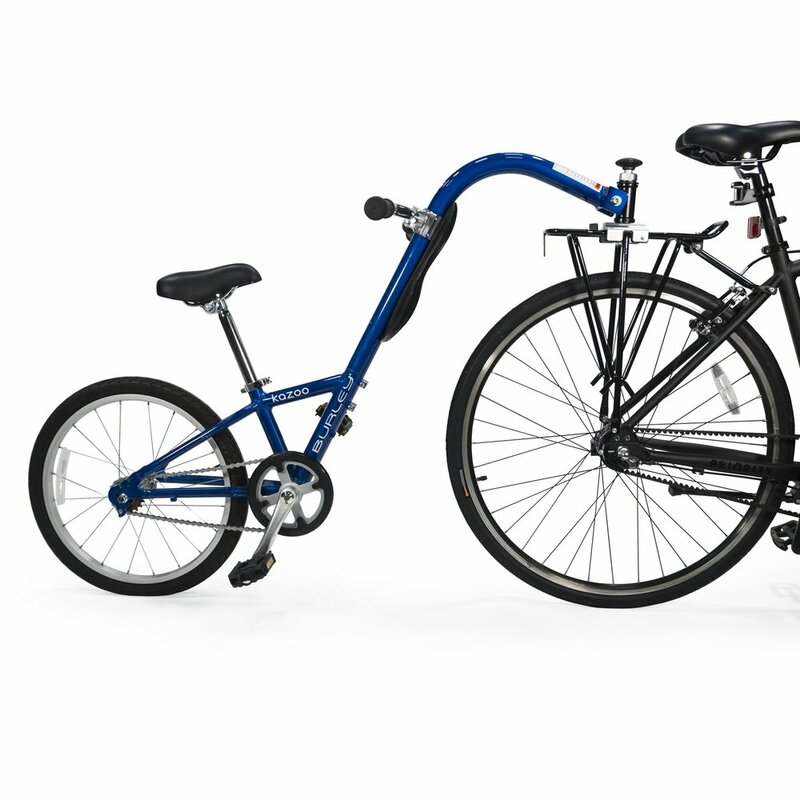 We offer the Burley Piccolo and Burley Kazoo, which are half-bikes attach onto the rear rack of your bike, and turn your adult bike into a Tandem bike! What could be more fun!? Pros: Develop child’s confidence and pedaling strength. Go farther on longer adventures. Simple attachment mechanism, easy to store, park, travel longer distances; can be taken on car trips. Cons: Child must ride attached to parent. The Burley Kazoo is an easy way for older children to get confidence on a bike, and go further than they could under their own power. There are a lot of different ways to move your family, and lots of new and exciting technology coming on the market. Come see us this spring, and we’ll help your whole family get started on the perfect bike setup for you!